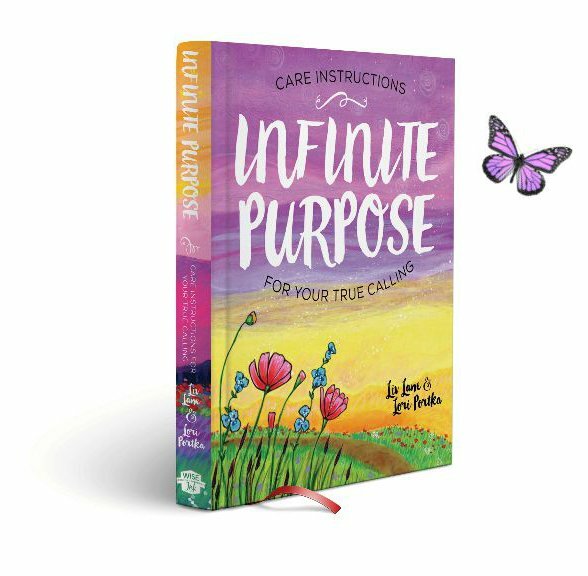 In a spirited swirl of creative magic, my dear friend Lori Portka and I made a dream come true with the publication of Infinite Purpose. We never expected to work together, especially not like this. But in the fall of 2014, Spirit swooped in to deliver profound messages through me, inspired art through Lori, and specific instructions (yes, really!) for sharing them with the world. Holy wow. We couldn’t quite believe it; we were humbled by it, honored by it…and nervous to reveal it. Over 250 people signed up to receive the initial messages and we were stunned to hear from so many about the life-changing impact Spirit’s words had on them. Within months, it was clear that those messages were meant to be shared with a wider audience — as a book that felt like a treasure. From the get-go, the support for this little dream was overwhelming. The crowdfunding campaign we launched that fall was one of the most successful ever in the self-publishing industry. Again, holy wow! And today, we continue to be amazed by the ways it is reaching new people ready to pave new paths.